Sometimes, I have the huge pleasure to discover Jazz Singers who move me from inside. If you don’t know her, Kristen Cornwell is one of those remarkable singers who can sing with an absolute vocal technique and it seems to be so natural ! Her last CD “Duke Ellington’s Sound of Love” mixes fresh arrangements with classic interpretations. It is a pure delight, that why I couldn’t keep it for myself 🙂 ! “The musician’s singer”, Kristen Cornwell enjoyed status as one of Australia’s most respected jazz singers for over 10 years before moving to Belgium in 2004. A graduate in Jazz of the National Institute of the Arts at The Australian National University she was a MO Award nominee in the Jazz Vocalist Section for four years running and a finalist in the National Jazz Awards. Kristen has also attained her Masters in jazz performance from the Royal Conservatory of Music in Brussels and established her own quintet. This quintet features some of Europe’s finest musicians: Pascal Schumacher (LUX) on vibraphone, Frederik Leroux (B) on guitar, Dennis Frehse (D) on drums and Christophe Devisscher (B) on bass. She worked with notable musicians including Don Burrows, James Morrison, Julian Lee, George Golla, Scott Hamilton, Carl Orr, Sandy Evans and The Australian Art Orchestra. She toured China twice with Don Burrows and along with two CD’s under her own name has featured on CD’s by Guitarist’s Jeremy Sawkins (‘Toys’), Carl Orr (‘Mean It’ and ‘Blue Thing’) and Steve Hunter (‘Condition Human’). Kristen was part of the outstandingly successful homage to Charlie Parker by Sandy Evans, ‘Testimony’, which was presented in the Sydney Opera House as part of the 2002 Sydney Festival. In April 2008 Kristen released her first CD in Europe with her quintet, Distant Skies, on the Belgian record label Jules Jazz. “a dazzling CD” according to Jazz Flits in Holland. 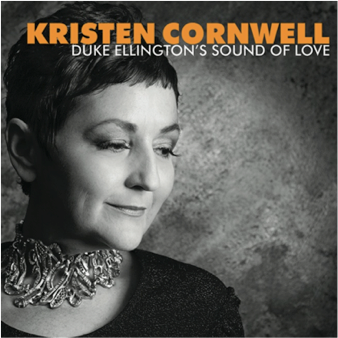 In 2012 Kristen released a second CD in Europe, Duke Ellington’s Sound of Love and mixes fresh arrangements with classic interpretations. “It is fantastic how (this recording) drips with decadence” (Jazzflits NL April 2012). On this recording Kristen comes into her own as a mature story-teller and a singer of supreme expressiveness. In April 2013 Kristen was invited to sing in Belgium with the Duke Ellington Big Band on their concert hall tour of Europe.